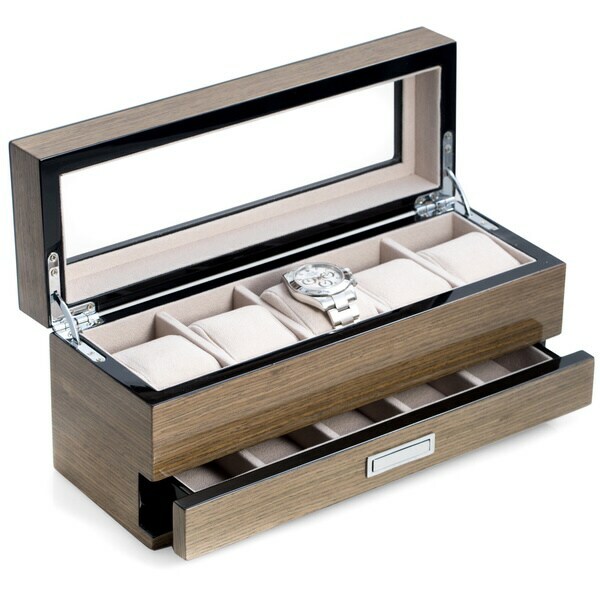 Keep your watches clean, organized and on display with this gorgeous lacquered box. A glass top for easy viewing and soft lined compartments completes this jewelry box. Very pleased with this watch box. Finish is nice and weight of box was a pleasant surprise. Really great looking in person. Holds my husbands watches and cuff links perfectly! He loves it. It's masculine yet classy. He's had it for over and year and it still looks great and stores all his watches, cufflinks and some necklaces. Beautiful watch box! Bottom drawer is pretty loose but not an issue for the usage for us. The quality looks really nice judging by the photos. I like the compact size and the combo of the watch/cufflink storage. For my son Christmas present.